Well, we laid low on Day 3. Some chores around the house (no fun in that) and then in the afternoon we went to Gianna's, our niece, family birthday get-together. Got to catch up with everyone. For all you crafters out there, my brother told me about this website that is closing out a bunch of stuff www.pedlarsretail.com. We ate some tasty BBQ chicken with fixin's. My brother-in-law is the BEST BBQ-er! He could open a restaurant. Really. In the evening, we came home we had Movie Night in our family room and watched Wall-E and ate our candy from Powell's Sweet Shoppe. We decided to go into San Francisco for Day 4. Little Cat B (14 year old son; does that make him Medium Cat B??) had been wanting to go to the SFMOMA for some time. On the way, we stopped in Berkeley at Zachary's for a slice of their delicious pizza and then another pit stop at Bake Sale Betty's to pick up some of her mouth-watering Ginger cookies for the car ride to the SFMOMA. The SFMOMA was fun, but it's safe to say I don't get modern art. I tried, really I did, but after viewing 3 of the 5 floors, Little Cat A and I went to the gift shop and had a fine time looking around. Little Cat A bought a very cool, clear bouncy ball that is filled with superfine blue glitter. It's mesmerizing. We then decided to head on over to the Ghirardelli Ice Cream Shop at Ghirardelli Square where we proceeded to gobble up 2 giant Hot Fudge Sundaes. Our tummies felt a tad woogley after the treats, so we walked around and peeked in some of the shops to give our stomaches a chance to settle before getting in the car again. There were a couple of shops that spoke to me and I had to explore further. First, there was Kara's Cupcakes. I adore cupcakes! The petiteness, the sweetness, the flavors, everything about them, I love. 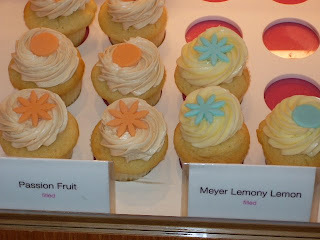 I bought a Sweet Vanilla and a filled Meyer Lemon cupcake. I ate the Sweet Vanilla in the evening. I savored it. I don't like to be rushed with a cupcake. It was the best tasting cupcake I've ever had. The frosting was tres vanilla-y and the cake had a bit of an almond taste to me. YUM!! The Lemon cupcake is still waiting to be sampled. 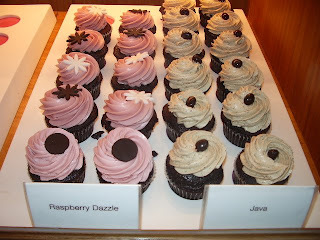 Here are a couple of photos of the cupcakes in their natural habitat..
We then strolled over to Lola of North Beach, a very cute paper goods and baby gift shop. We poked around a bit, had a few laughs at some of the cards, bought a card that sparked an idea for a Print Possible holiday card and had a lovely chat with the woman who was working there. Then off to home we went. I made chicken noodle soup for dinner and we popped popcorn and watched Bee Movie (a very clever movie in my opinion). Whitney, I'd like to see the calorie count for your Family Fun Week! Holy Smokes you guys know how to find the goods! !